One of the key features introduced in the AirDroid 3 is AirMirror, which lets users control their Android handsets remotely via the desktop application. Using the beta feature, users can reply to messages and perform other tasks on the Android handset via the Mac or Windows using mouse and keyboard. The firm is showcasing the feature with a WhatsApp use case, where users can interact with smartphone app on their computers. It is worth noting that the AirMirror feature is only supported by rooted devices running Android 4.0 Jelly Bean and higher (or if the Android device is AirDroid-certified). The firm notes Android 5.0 Lollipop is not supported. Incoming call alerts will be also showcased on the desktop screen when connected with the smartphone. 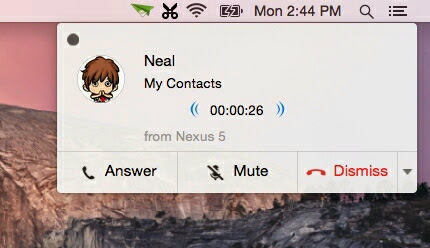 Users will be able to mute or dismiss calls, reply by SMS, and answer it on their phone. "With AirDroid 3, your multi-screen life is easy like never [before]. You won't miss any important messages while focusing on your work. You [can] receive/reply SMS on computer, most importantly, you can put your Android device under full control by mouse and keyboard, even without your phone with you," stated the company blog post. 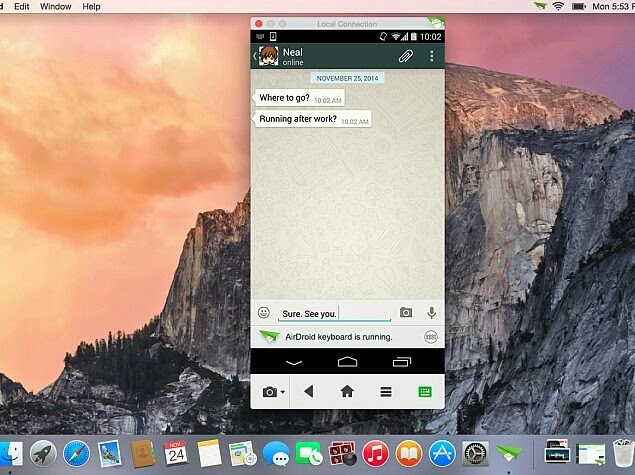 AirDroid 3 for PC and Mac now comes with a better notification management. The notification mirroring feature shows all the notifications from the Android device in real time, and have the option to turn on a 'Do Not Disturb' silent mode for individual apps. Users will now also be able to receive and send SMSes from their Android smartphone on their PCs. The blog also states that the with AirDroid 3, the firm has also introduced end-to-end encryption for all text messages, notifications, and other account credentials. The new version lets users transfer files between the Android handset and desktop or vice versa, and also between two connected Android devices. Users can simply drag and drop files which they want to share via local or remote connection. Files to be transferred by remote connection will available to download for seven days from the AirDroid server, after which they will be deleted. The new Android app version has also been redesigned to match the Android 5.0 Lollipop's Material Design. The desktop clients, as noted by The Next Web, however still lack some of the features offered by the AirDroid Web interface, and the firm says it will continue to update the latter despite the rollout of the Mac and Windows clients. Some of the missing features of AirDroid 3 include browsing files and photos, accessing camera app, locating the handset, take screenshots, change ringtones and more. The updated AirDroid 3 app is available to download from Google Play, while the Mac and Windows apps can be downloaded from the 'Download' tab on the company website.